You don’t have to live the surf lifestyle to work up an appetite. 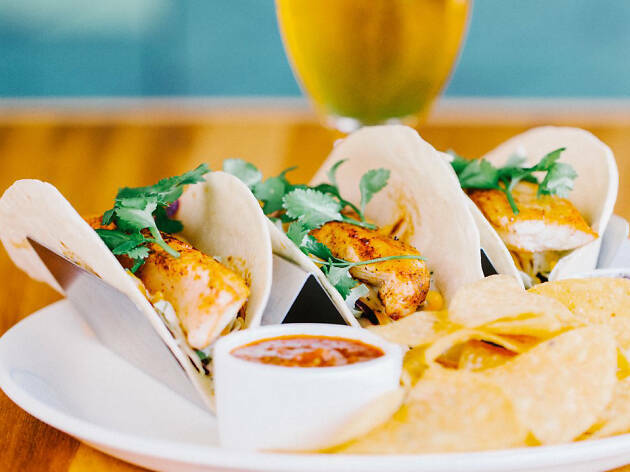 We’re pretty sure just glancing at the menus of Malibu’s best restaurants and bars will do the trick, no wave workout required. This coastal city’s spots offer some of the freshest seafood in the region—surprise, surprise—but there’s so much more than sushi and beachy digs. 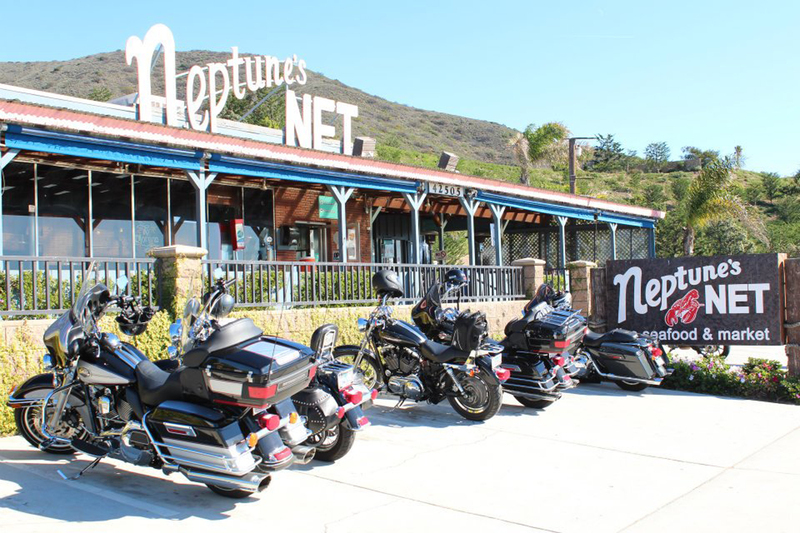 On the Pacific Coast Highway, you’ll find some of the most iconic dives and patios along the coast, as well as fantastic gelato, Thai food and Greek fare. There’s barbecue and alfresco dining to be found in the hills, and wood-fired pizza to be enjoyed near the water. 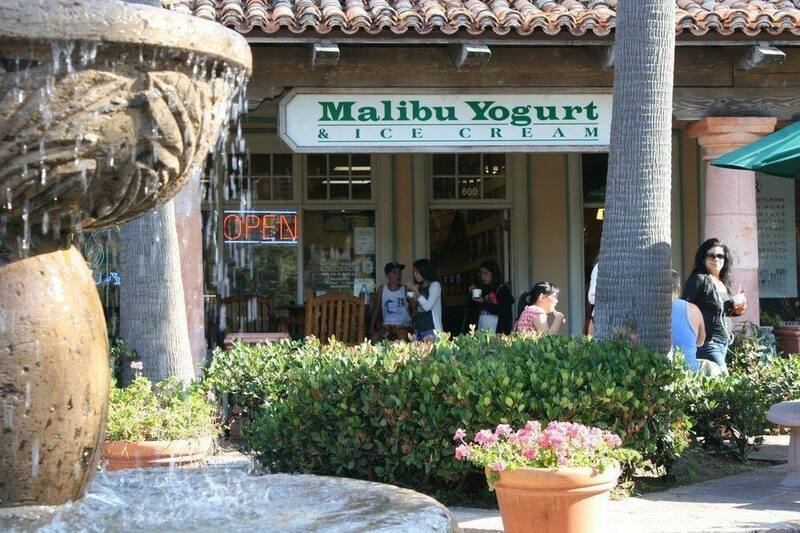 Here’s our guide to eating through Malibu like a local—we hope you brought your appetite, and maybe some sunscreen. 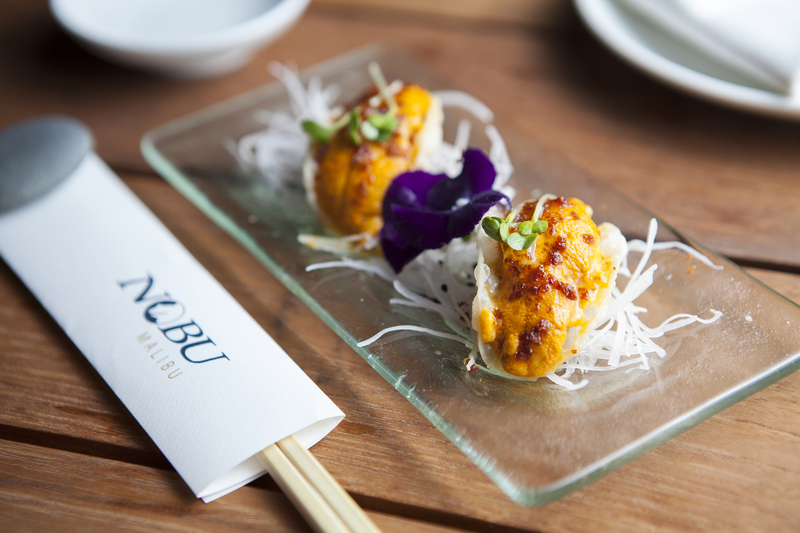 Longtime locals will remember Nobu as being nestled in the corner of Malibu Country Mart, but while the world-class restaurant’s location has changed, its quality and creativity haven’t budged a bit. 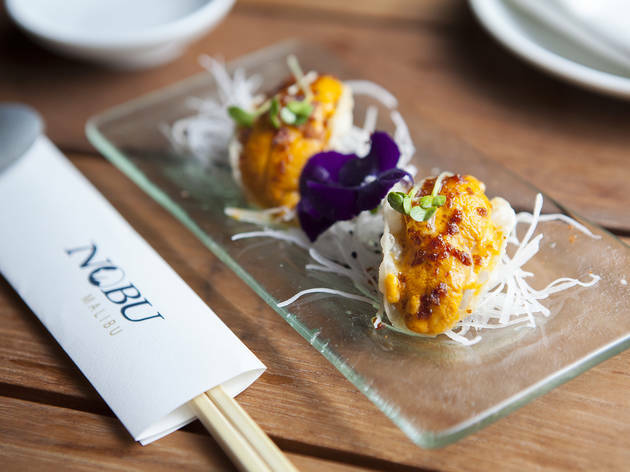 Still one of the city’s top restaurants—and one of the region’s best sushi restaurants—Nobu now features prominently along PCH with a spectacular view of Surfrider Beach. Along the water is the perfect place to celebrate Nobu Matsuhisa’s inspired sushi and seafood-centric menu, whether it be crab cakes topped with an uni bernaise, the artful salmon kelp roll or the legendary black cod with miso. Reservations here are a must, as is a seat on that stellar oceanfront patio. Ask any local where to find the best Greek food in Malibu, and the answer will always be Taverna Tony. Find a bright and rustic setting indoors and a trellised patio outdoors, setting the scene for platters of Mediterranean fare. Order whole, grilled fish, a spread of house-made dips (the taramasolata is a must), rotisserie meats and addictive pastas that magically disappear from your plate. Can’t decide? We can’t blame you. Opt for the Greek feast, which includes 15 items, so you can really get a full taste of the menu. This one’s far from the beaten path: You’re technically in Calabasas by the time you snake your way through the mountains and onto the grounds of this luxurious former celebrity retreat. 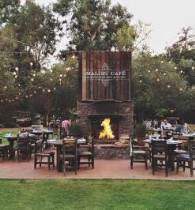 But the glamour that captivated Hollywood stars—and Malibu’s nature-loving ethos—can be felt throughout every inch of this rustic restaurant and lodge. 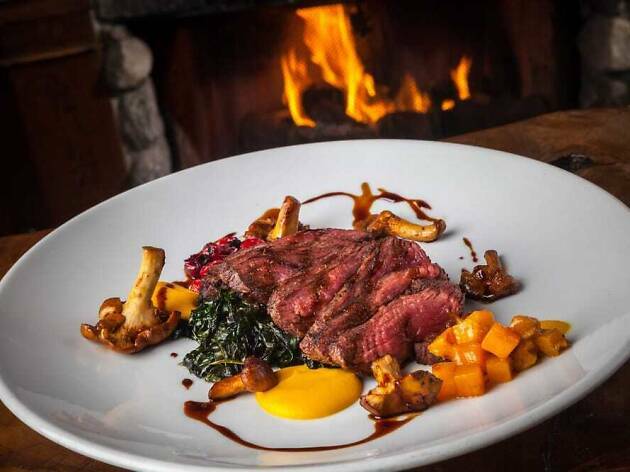 Whiskey bottles and leatherbound books line the shelves, antlers dot the dining room, and the speciality of the house is game: Elk, emu and venison are favorites, though the specials can include even more exotic fare. 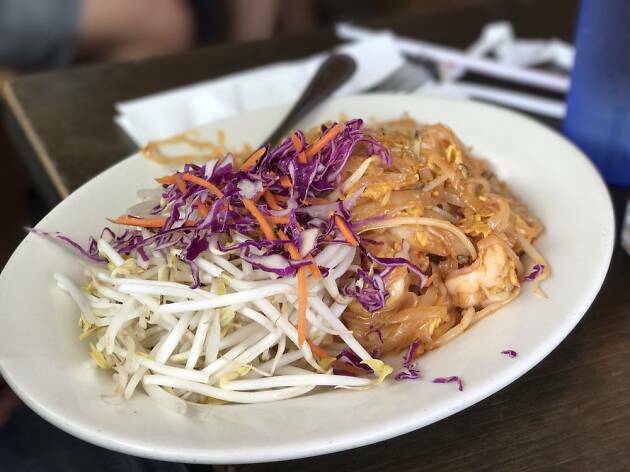 Brunch is a local favorite, as is the spacious patio, which seats you under lush, low-hanging tree branches to really make you feel at one with nature. 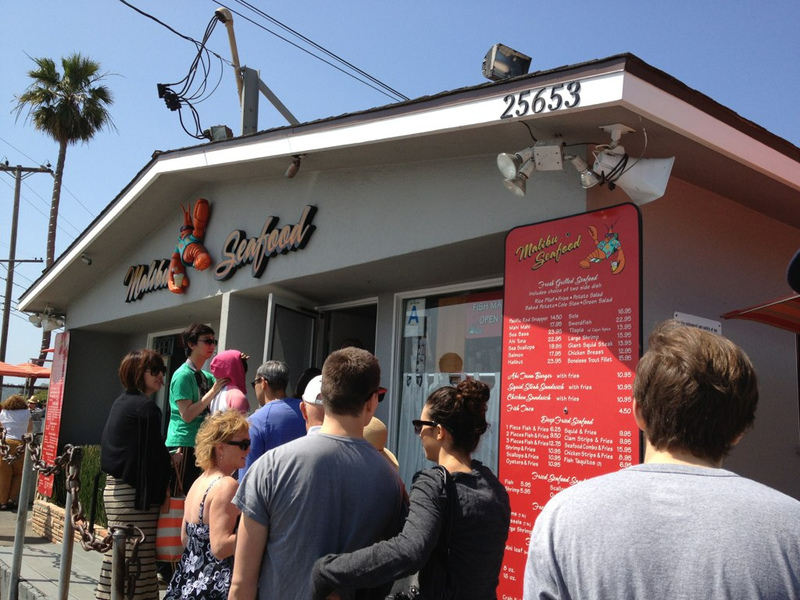 This tiny blue blip along PCH looks like a surf shack, and while you’re bound to meet one or two sunkissed stragglers coming in from nearby Topanga Beach, what you’ll really find here is one of the best-kept Thai-food secrets in L.A. A Malibu staple for roughly 30 years, Cholada serves a vibrant, spicy, wide variety of curries, salads, pan-fried noodles and, given the location, seafood. We love the fresh, fried calamari with its accompanying peanut-topped sweet dipping sauce, but you’d be hard-pressed to go wrong by adding succulent, enormous shrimp to any curry. The food enough is a drawl, but the congenial service from Cholada’s husband-and-wife team only makes it all sweeter. 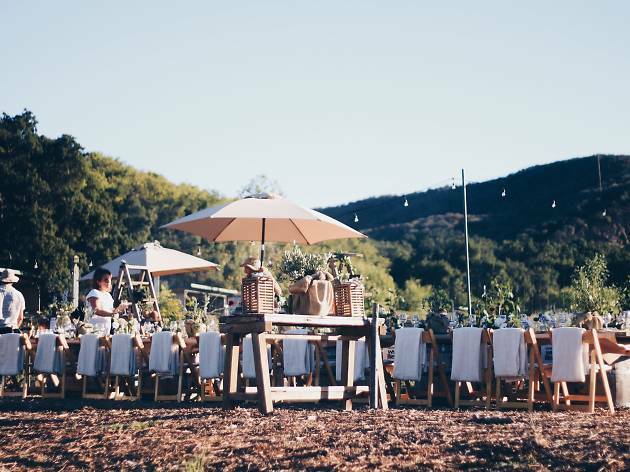 Sitting pretty on 1,000 acres in Malibu and the stunning Santa Monica Hills, Saddlerock Ranch offers scenic terrain, a vineyard, wine safaris, historic caves and stellar views, but if you’re into dining, it’s got even more up its sleeve: Saddlerock Gardens, the venue’s dinner series. Each alfresco event features its own unique, family-style menu that kicks off with a drink and some mingling, all while you can watch Saddlerock’s team of chefs preparing the meal outdoors. At $150 per person it’s also a great deal—each event is roughly five hours, and includes free-flowing wine pairings. Looking for something a bit more adventurous? 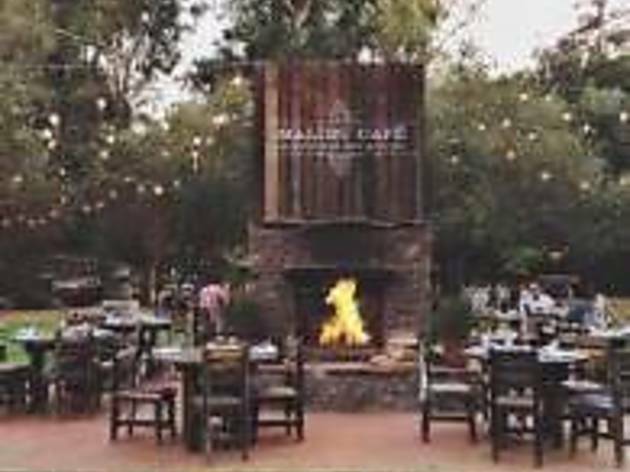 You can also book a safari tour to go with your dinner ($185 for both), where you’ll get a tour of the land and meet some of the farm’s animals—plus try complimentary tastings from Malibu Wines—all before dinner. Waterfront? This spot’s water-on. 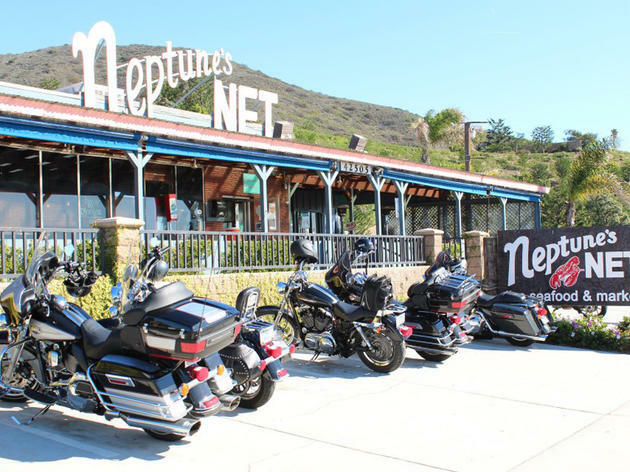 Find upscale cafe fare in a casual setting in this bright and cheery eatery at the very edge of Malibu Pier, serving up fresh California fare like cauliflower pizza as well as some serious grass-fed burgers. Enjoy organic veggies, farm-fresh eggs and more all while perching over the Pacific. Not bad, not bad at all. 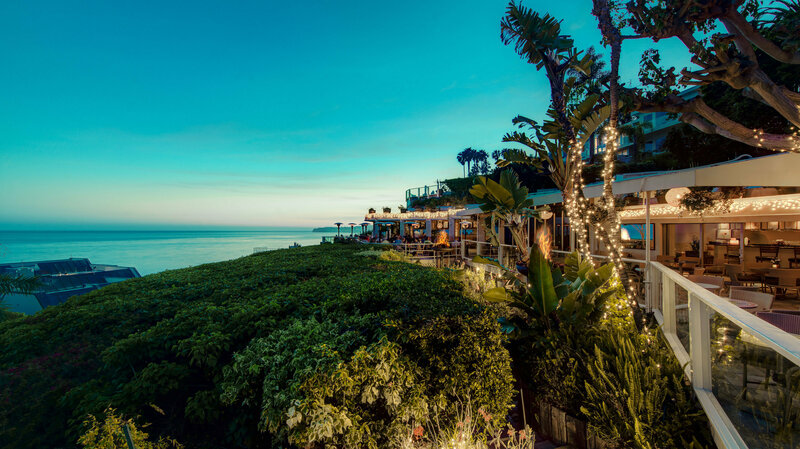 It's not as though surf-capital Malibu wasn't already full of mahalo vibes—it's just that none of its restaurants give a nod to Hawaii quite like Duke's. Built right on the water and sporting a surf motif (all a nod to father-of-surfing legend Duke Kahanamoku), this restaurant is breezy, fun and feels borderline tropical, with items like coconut shrimp with lilikoi chili; macadamia-crusted fish of the day; sashimi; banana-leaf–steamed seafood; and the best fish tacos in Malibu. 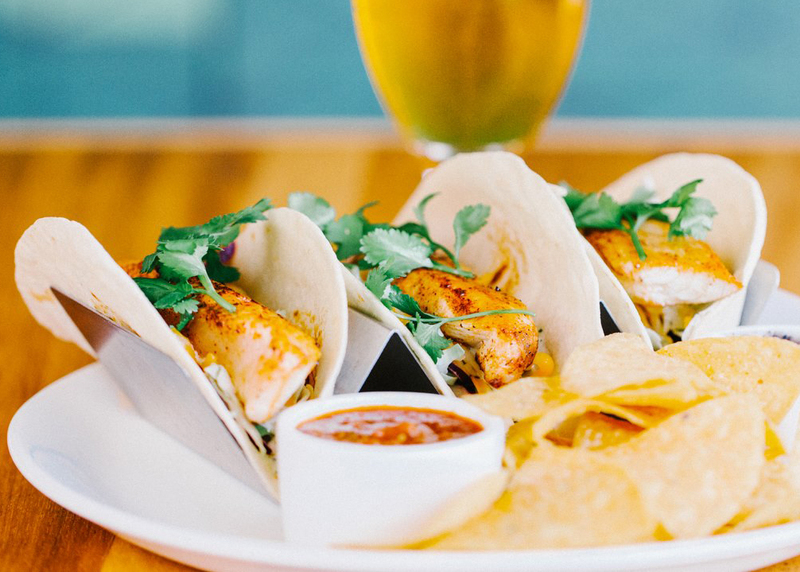 Stop by on Tuesday for $3 tacos with a view of the waves crashing and just try to tell us you're not having fun. You can live out your Old West fantasies in this rustic, saloon-inspired wooden restaurant where meats get roasted over an open flame and the whiskey flows like water. Daily specials such as venison or wild boar are enough to make us feel like we’re taming the mountains of Agoura Hills, while a full weekend brunch menu and modern dishes—like the upscale grilled cheese sandwich smeared with a blue-cheese aioli—remind us we’re in the 21st century. 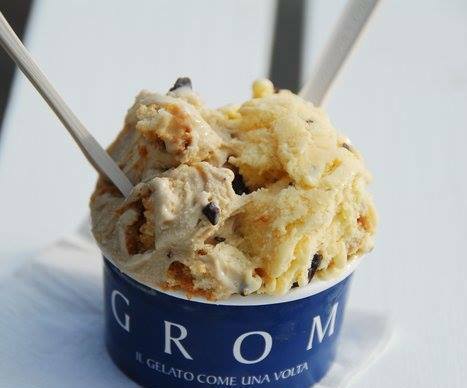 Looking for authentic Italian gelato? You’ve come to the right place, and that place is in Cross Creek. 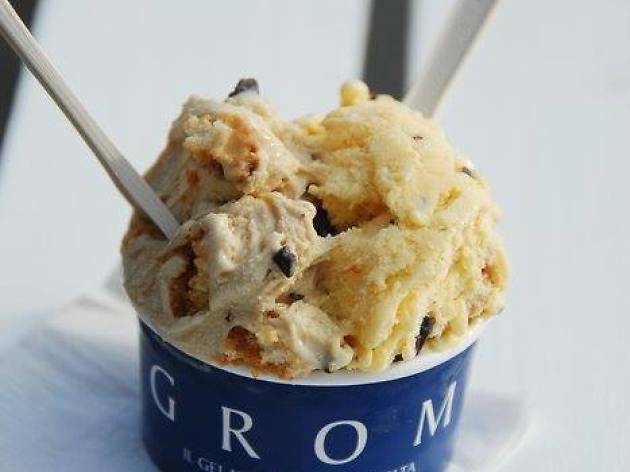 Find a range of flavors at Grom, all folded into cage-free eggs and high-quality cream, churning fresh fruit and artisanal ingredients into thick and lucsious scoops. But this cheery gelateria goes beyond, serving up fruit sorbet, granita Siciliana (Italian ice), hot chocolate, gelato shakes and ghiaccioli—those adorable, colorful frozen fruit pops that sit in the case up front. 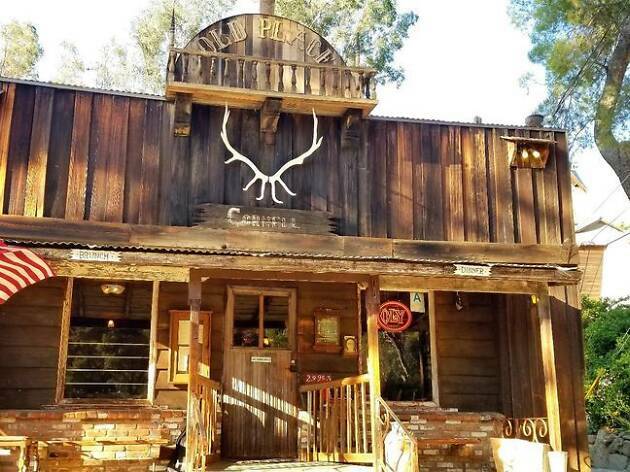 Take a drive through Latigo and make a turn onto Calamigos Ranch, where one of Malibu’s most fun and lively restaurants awaits. 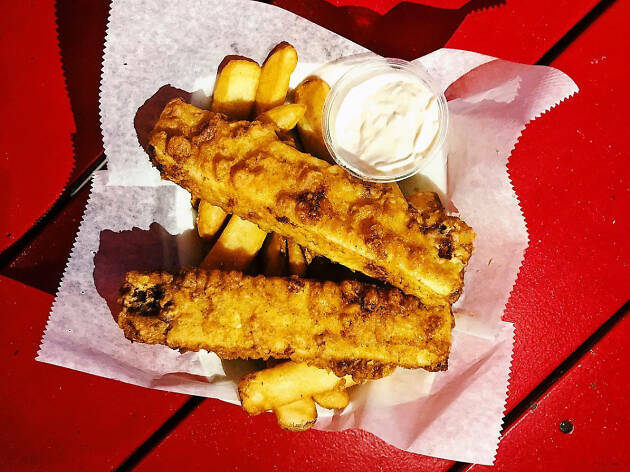 The giant Jenga and bean bag games, as well as picnic tables, make it a perfect alfresco destination—and then there’s the food. Grab some of the “nouveau barbecue” smoked on-site, or snack on some of the elevated bar bites: tater tot poutine, blue crab hush puppies or one (or all) of the variety of bruschettas. There’s brunch and a kid-friendly menu, to boot, not to mention a full bar that’s also stocked with frosé. 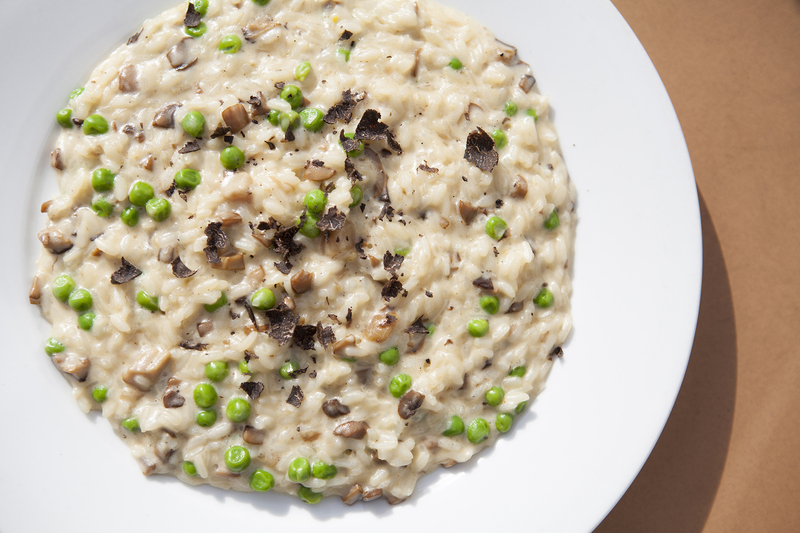 While by no means as haute or innovative as some of the newer Italian restaurants spread throughout L.A., this stalwart nails simplicity. 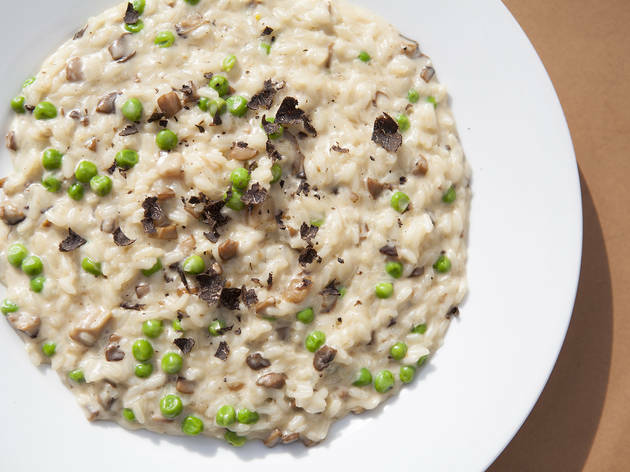 Tra di Noi is the local go-to for handmade pasta, decadent rissoto (always opt for the truffle), and anitpasti like beef carpaccio and stuffed zucchini blossoms. 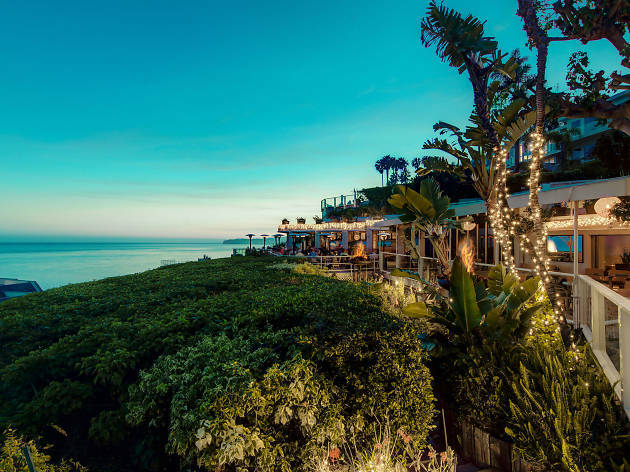 This Malibu Country Mart spot offers an extensive Italian wine list, and also features a prime patio—all the better for celeb spotting and people watching. 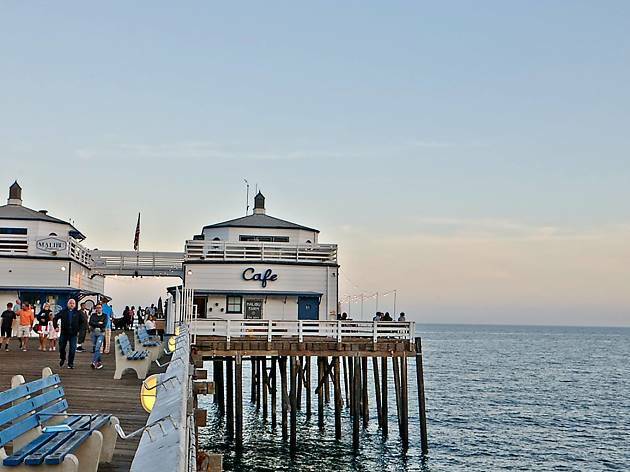 Enjoy a meal at one of the city’s most iconic special-occasion stalwarts, which just so happens to sit at the edge of the Pacific for a view that can’t be beat. The unenclosed dining room makes even “indoor” views of the sea possible from every angle, and tall hedges to the sides of that killer patio only add to this high-profile spot’s exclusive vibe. Straightforward seafood and steaks are king here, though you’ll find a few deviations from the norm by way of alligator wontons and miso-braised tofu. Reserve a spot on the patio for sundown, for best results. Spruzzo sits right by Zuma, making it the go-to spot for to-go pizza on the beach for decades. If you’re avoiding the possibility of sand in your food—sure, fine, that’s probably the responsible thing to do—then the freshly remodeled dining room will still give you a glimpse of the ocean while you enjoy those wood-fired pies or generous pasta portions. See also: There’s a firepit, if you’re taking in the view from the patio. 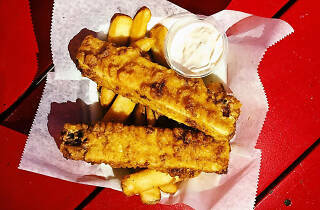 Photograph: Courtesy Malibu Burger Co. Breathing new life into the former home of Guido’s (R.I.P. Guido’s), the brand new Malibu Burger Co. brings customizable burgers to the table, offering patty choices of beef, bison, veggies, turkey or fish. Top ’em with cheese, house-made ketchup, vegan cheese, pickled shallots, marinated tomatoes and more, then wash ’em down with a thick ’n’ creamy milkshake. 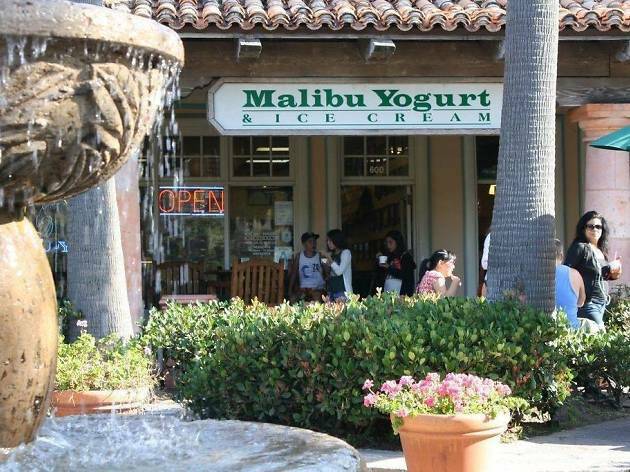 Malibu Yogurt’s been serving froyo before it was, well, cool. This sweets staple serves 16 flavors of fat-free yogurt, plus regular ice cream, making pared-down sundae classics, scoops and swirls for more than 30 years. Mix and match your bases and toppings, get them in a shake or piled high in scoops on a waffle cone. When you want to satisfy your sweet tooth like a longtime local, this is where you go. Looking for more to do in ’Bu? While some associate Malibu with mansions perching on the cliffs and surfers bobbing on the breaks, we tie the city to L.A.'s most stunning natural wonders. 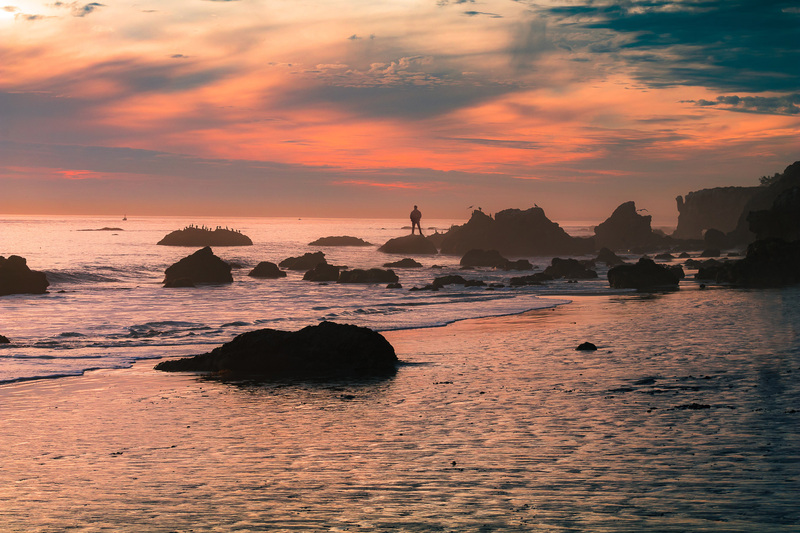 Forget the tarnished glitz of Hollywood and the posh landmarks of Beverly Hills; these things to do in Malibu make us question why we don't spend every single weekend in the waterfront city. 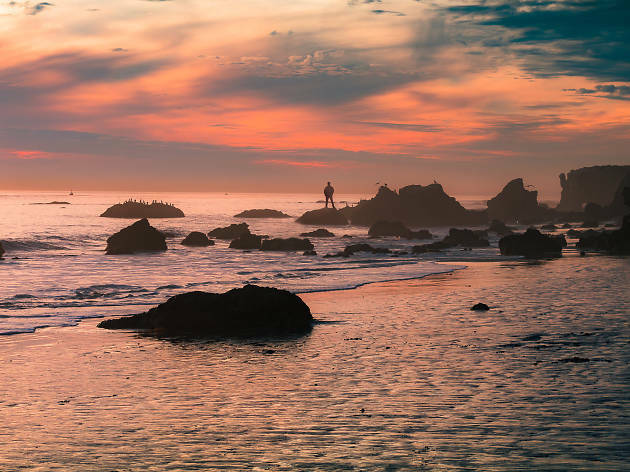 From some of the best beaches around to hiking trails with waterfalls—and a little bit of wine tasting to wind down—we've rounded up our favorite things to do in Malibu.